Got the fuselage all spackled up. Took two coats of spackle because the lines are a pain to get filled right. 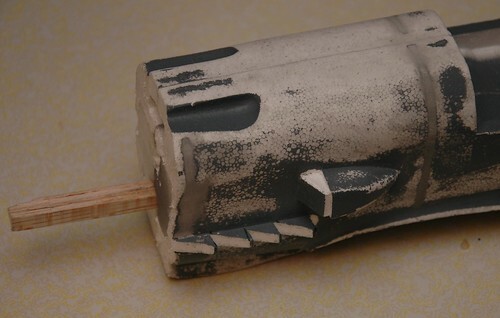 I also took the time to cut the radiator a little nicer (it's actually two interlocking pieces in real life) and got the fins for the engine exhaust cut. I also got the vertical stabalizer spackled, and the cockpit, but I don't have a picture. Okay, so I managed to get some more progress on the retractable landing gear front, and boy, am I surprised its all working out. First thing I cut out some channels for the servo arms to run to the retracts positions and hollowed out a little hole for the servo itself. Right now everything is fit for an HS55 servo, which may or may not give me enough throw to fully retract the gear... I'm going to test this of course before I finally mount everything, but since any other servo is going to be bigger than the HS55, I figured fitting it first would be OK. 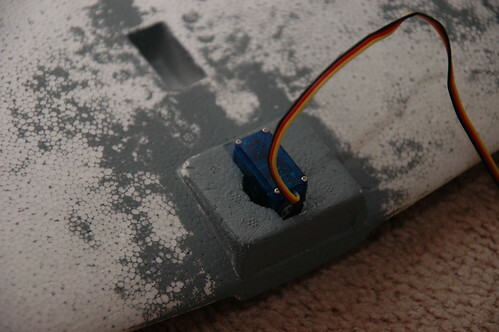 It gets the servo out of the way of the ESC that is going to be mounted right above it in the fuselage cavity. I'm really glad I noticed this before I actually started gluing things! Going to put the retracts aside for a bit. 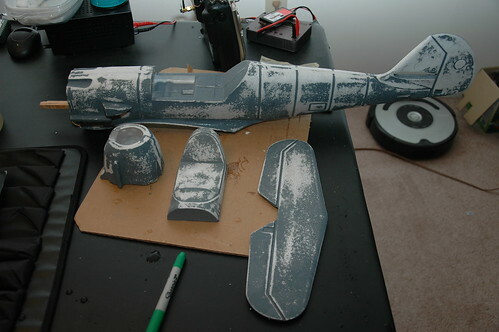 Next step, spackle the fuselage. First off, this is by FAR the scariest part of the build so far. I'm absolutely terrified of cutting into the wings of the plane. 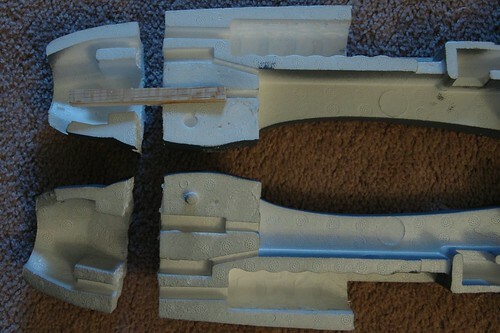 The practice I had cutting out various bits of foam in the last step certainly helped me get the confidence up though. I've somehow gotten it into my head that I need retractable landing gear (probably something to do with being totally awesome). So the next step in the build involved a lot of planning (i.e. 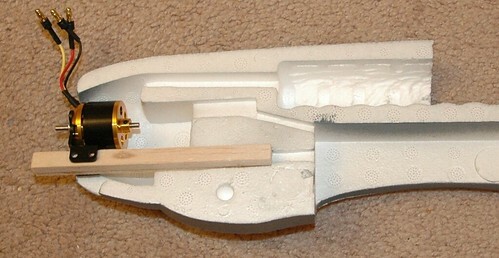 holding the wing and trying to figure out how it was all going to work) and waiting for the retracts I ordered to arrive. When they finally showed up, I spent some more time thinking about how I was going to mount them and decided I would need to build something to screw them in to. First, I used the actual retracts to trace out the outlines of where I wanted the retracts to go using a marker. This let me get an idea of how it would all go together. 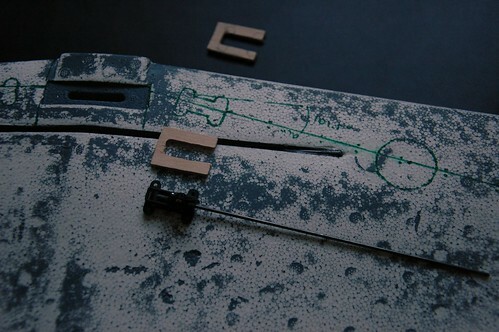 Next I cut the little mounting platforms out of some aircraft plywood I had left over from a previous project. Next came the scary part: Actually mounting them in the wing. 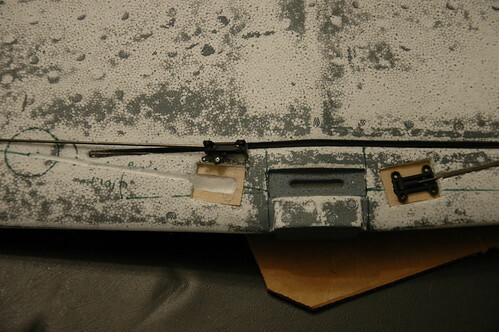 First I cut a depression in the wing that the mounting platforms could sit in, and made sure it was snug. It helped to trace the wood with the Xacto knife rather than trying to measure it and get everything lined up that way. 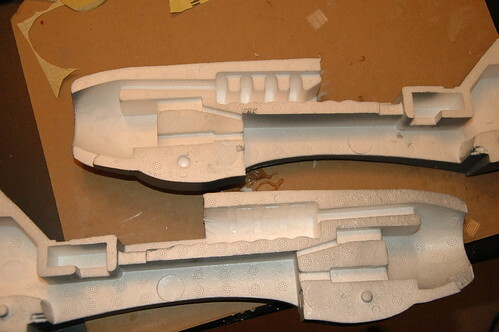 Then I had to hollow out some more of the wing to allow the retract mechanism to function. 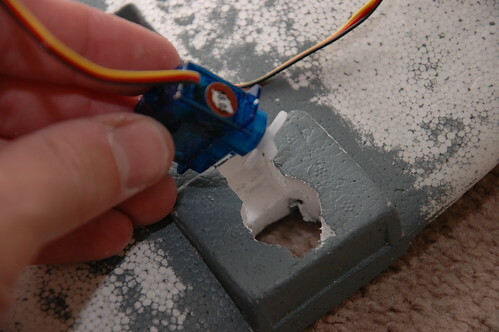 To do this, I used both the Xacto knife (to cut the sides of the cavity) and then the dremel (to hollow it out and do more serious material removal). 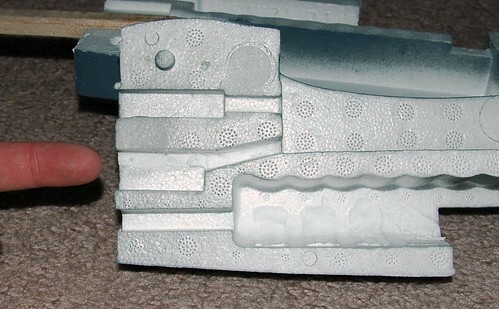 I ended up with a ton of tiny styrofoam particles and a little hole in the wing. A side note: I found it best to run the dremel on its slowest setting with a straight edged rotary cutter (since I didn't have a grinding bit like other people I've seen). The straight edge helps a LOT when carving out sides of the cavity. The only other trick is to go slow and be careful, the dremel will sink through the foam like it wasn't there, so make sure you're holding steady. I kept going, test and testing and testing after almost every cut. One of the hardest parts is making sure the two sides of the gear are at the same angle. (We'll see how I did when it comes time to hook some actual wheels up to this thing.) I'm hoping I can fix any little errors when it comes time to actually glue the retracts into the wing. At the end of the operation I had a both retracts (almost) mounted in the wing, but there's still a lot of work left to do. 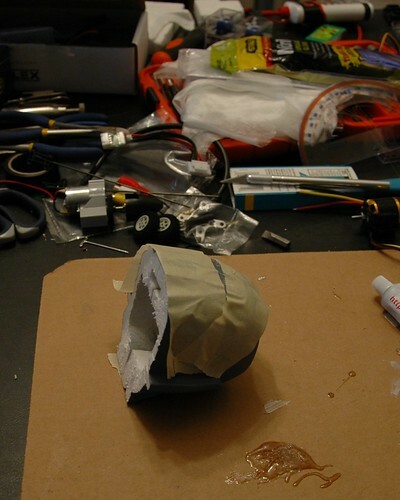 So when last I left off, I had just test-fit the newly minted stick-mount for the brushless motor. 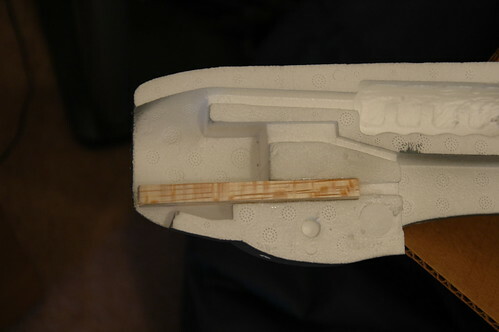 The next step was to actually glue that sucker in there, and after reading a bunch of forum posts about getting the engine mounted right (thrust angles!) I decided to bite the bullet and glue that sucker in. I ended up using the same angle that the instructions recommend (I think its 2 degrees to the right) and mounted it pointing a bit down. Hopefully that'll be enough of an angle to offset the torque from the motor. We'll just have to wait and see when I maiden it. 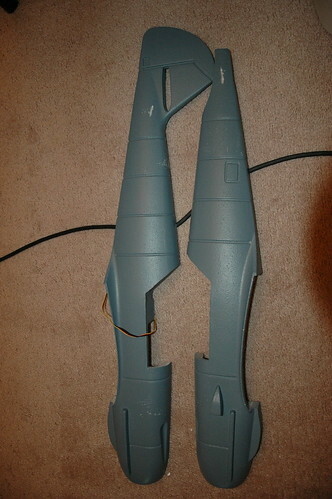 I'd received the retracts that I'd ordered on Friday, so I set about planning on how to mount them. After much referring to various pictures and looking for examples on the web I marked off the position of the wheels and mounts. 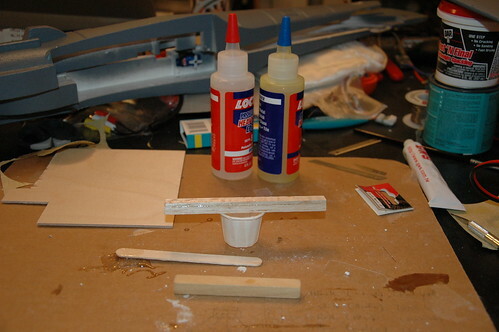 I also took the opportunity to glue in the wing-spar. I used a hollow carbon-fiber tube that I have on hand (I'm going to use them to attach the engine nacelle later) instead of the pole that came with it (since the carbon-fiber is lighter). The thought of cutting into the wing absolutely terrified me, so I promptly set that aside and set to work on something a lot less scary. 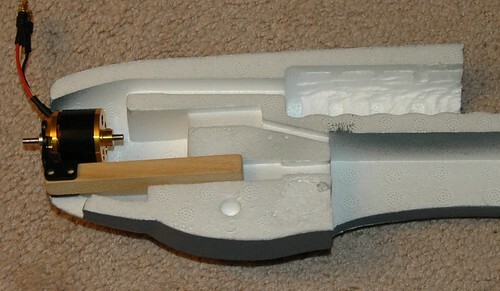 The modification I had originally planned to make to the fuselage before it got glued together was to modify the engine nacelle so that it was detachable. 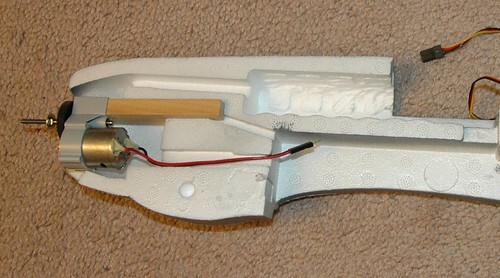 This will make getting to the engine a lot easier [read: possible] and is a pretty popular modification for this model. 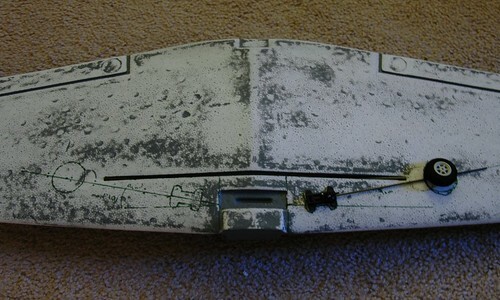 I was humming and hawing about whether to cut the nacelle off before or after I glued it, and decided to do it before. I was a bit sloppy with the Xacto knife, but I think it wasn't too terrible. I'm hoping to be able to clean it up a little when I mount it back on the fuselage (with a little help from my good friend Mr. Lightweight Spackle and Mrs. Sandpaper). After cutting the nacelle off, I decided that I might as well give the motor and ESC a test-fit to make sure everything was going to meet up in the right places before I glued it all together. Boy am I glad I did! It turns out that the wires on the ESC and the motor were just a little too short (because I had to mount the motor out a little further than originally planned). Since I hadn't glued the whole thing together yet I was able to fix the problem by enlarging the wire channel from the nacelle a bit. This would have been a HUGE pain if I had already glued everything together. With my trusty Xacto knife I managed to do quite a nice job straightening out the channel to give myself that tiny little bit of extra space that would allow me to mount the ESC right up front. It was right before I reached for the glue (for the second time) that I remembered something I'd seen on a 109 build thread about a different way to mount the aileron servos (instead of the double-sided tape the instructions mention). 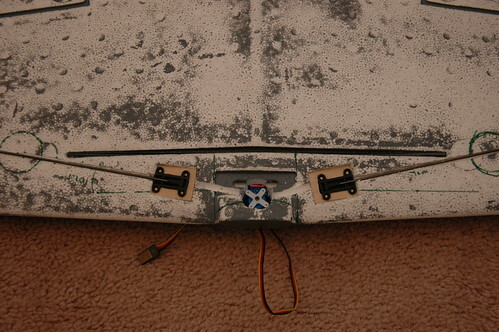 So, I whipped out the Dremel and the Xacto knife and made myself a little tray for the aileron and rudder servos. I had to shave off a little of the foam in the fuselage to keep them the same height as they would have been before, but since I hadn't glued the fuselage together yet it was really easy. There are two reasons I can think of to mount the servos this way: 1) This fixes them more tightly in place (they don't flex at all because they're screwed into the wood) and 2) I can more easily change the servos if anything goes wrong. I haven't actually mounted the little servo tray yet, but here's a shot of where it will go (you can see where I cut away enough foam to keep them mounted in the original position). My new brushless engine for the Me109 arrived today! I'm impressed with how fast it shipped, I ordered it at the end of the day thursday and it showed up at work just before noon. Yeay for the internet and shipping. 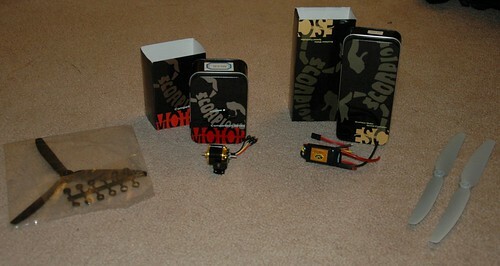 As you can see from the pictures above, the ESC and Motor came in some bitchin' metal cases, I was very impressed with the presentations. Now that I have the engine, I decided to see how it would fit. Good lord am I glad I didn't start gluing things already. You can see from the next two pictures that I'm going to have to mount the engine in the reverse orientation. Instead of having the stick mount on the top of the engine nacelle, I'm going to have to flip it around and mount it on the bottom (since there's no gearbox and the spinner needs to be in the middle of the model). That's all well and good, except that, as you can see from the pictures, in order to get the engine far enough forward to spin the prop in front of the nacelle, I'm going to need to pull the stick WAAAAY out of the housing. So far out in fact, that I'm terribly worried it wouldn't be enough foam to hold the engine safely. So what am I going to do? Well, I rummaged around in a bag of spare balsa wood peices that I had lying around, and managed to find some bits that I can epoxy together to make a longer stick mount. It turns out that they're the perfect size once they're glued together. I'm going to let the epoxy dry overnight, and might give it another go tommorow after work. Here's hoping everything goes better next time. Also, I need to clean my table. I was planning on working on the fuselage yesterday, but after planning a bit, I think I'm going to wait until I get the rest of the power system (engine, speed controller, prop, etc..) that I ordered. 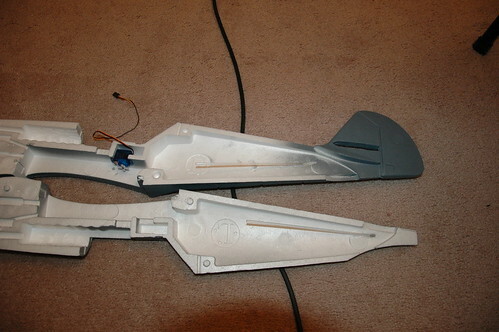 I want to make sure it fits before I seal up the fuselage, which I'm hoping will save me some trouble. So, instead I decided to do what I could and install the guide-tubes for the rudder and aileron into the fuselage halves. This had to be done before I could seal the fuselage anyway, and doesn't depend on the power system at all. 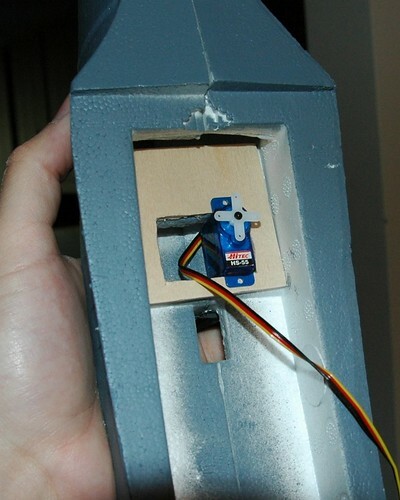 I'm going to modify the engine nacelle so that its removable, but that's going to wait for another day. 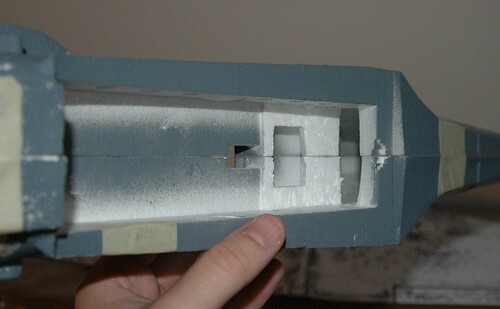 I can still sand and spackle the fuselage, but I would really like it to be assembled before I do that, so I know the pieces are fitting together nicely. I also went ahead and enlarged the battery compartment, it was made for NIMH battery packs, and I'm going to be running off of lipo, so it needed to be trimmed back a bit. I'm going to test-fit my batteries before I seal it up, and probably add some fuzzy side of velcro to the top and bottom to make sure its all snug when there's a battery in there. 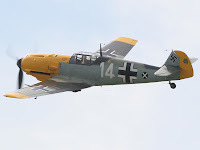 I've spent a lot of time since I got my plane earlier in the week planning things out (I probably spent MOST of the week looking for pictures of 109's and looking for paint schemes I want to do). After reading through a bunch of posts on these threads and looking very carefully at the various pictures, I decided I might as well get started. Since I want to get this plane close to the real version, I wanted to take out the panel lines that GWS has etched into the model when you buy it new. That means spackling up the lines and lots of sanding. Since I got the pre-painted version, it was a bit of a pain to sand (the paint kept binding up the 320 grit sandpaper I have), so I ended up doing it wet (running it under the tap while I sanded). I used my finger and a piece of cardboard from an old cereal box to smooth out the lines as I filled them. 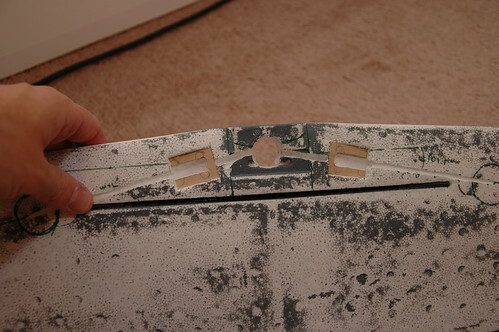 I tested it out on just a portion of the wing first, and you can see in the picture how I ended up sanding most of the paint off when I sanded the spackle. I ended up going through and sanding off the rest of the paint and the fake 'bolts' that are on the wing before I did the rest of the spackling. I let it sit overnight, and sanded it all down the next morning. I had to do this twice because I had a little trouble getting the spackle to fill the lines and not pull out after I'd done it. Right now I have the top of the wing finished, and am ready to do the bottom. So I'm getting into RC stuff. I've had a Mutliplex Twinstar II for a while now and I'm loving it. 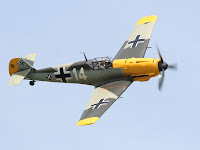 Its a fantastic plane, but its not THE fantastic plane. 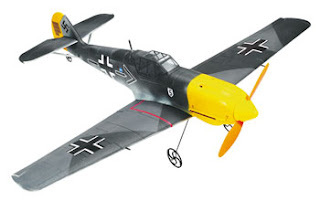 The Me-109 is probably one of my favorite warbirds of WWII (after the lovable lil' Stuka of course) and since I was thinking about picking up a more aerobatic plane than the Twinstar for when I just want to go and mess around with loops and rolls and stuff, I went and picked up this kit from Tower Hobbies. It came in the middle of last week, and I quickly set to work reading all about it and looking around at various build threads. I'm going to try to log my progress here. This is my first actual kit build and I'm incredibly nervous about actually doing it. I want to make it as true to the real model as possible, but we'll see how that works out :). "No battle plan survives first contact with the enemy" after all.